What Day Of The Week Was March 8? 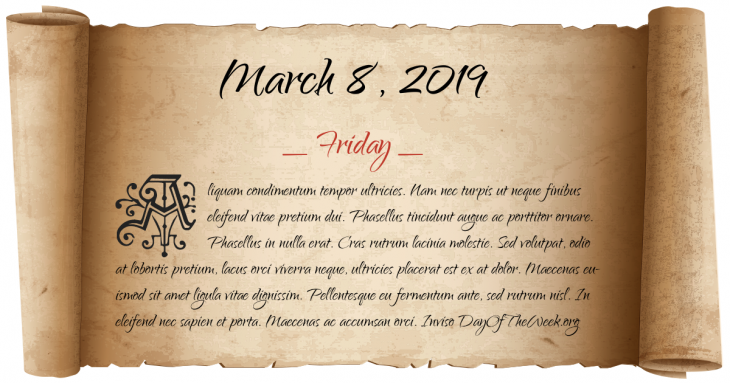 March 8, 2019 was the 67th day of the year 2019 in the Gregorian calendar. There were 298 days remaining until the end of the year. The day of the week was Friday. Here’s the March calendar. You can also browse the full year monthly calendar. Following the death of his mother Urraca, Alfonso VII is proclaimed king of Castile and León. An anonymous writer, thought by some to be Thomas Paine, publishes “African Slavery in America”, the first article in the American colonies calling for the emancipation of slaves and the abolition of slavery. International Women’s Day is launched in Copenhagen, Denmark, by Clara Zetkin, leader of the Women’s Office for the Social Democratic Party in Germany. International Women’s Day protests in St. Petersburg mark the beginning of the February Revolution (so named because it was February on the Julian calendar). Spanish Premier Eduardo Dato Iradier is assassinated while exiting the parliament building in Madrid. Spanish Civil War: The Battle of Guadalajara begins. A failed assassination attempt on Sayyed Mohammad Hussein Fadlallah in Beirut, Lebanon, kills at least 45 and injures 175 others. Who were born on March 8?